NHN Japan, hot on the heels of hitting its 40 millionth user milestone for its popular Line calling/messaging application, has today announced the release of Line for Windows Phone. Currently Line is available for iOS, Android, and there are also messaging apps available for PC and Mac. But the company aims to have Line available across all platforms and services, and the move to Windows Phone is a step in this direction. It does come as some surprise since Windows Phone is not especially popular in Japan yet . But it should increase in popularity as local carriers continue to add more handsets to their respective lineups. It should be noted, however, that this version of the Line app will only allow for the messaging function, and not the free voice-calling function. The company notes that this function will be added to the app in a later version. Line has proven to be wildly popular so far, racking up new users at a meteoric pace. NHN Japan sees the service as a platform upon which it will deliver new services, such as the ever-so-cute photo app Line Camera which it launched two months ago, as well as its Sticker Shop within the Line app, which catapulted the iOS version of the application onto the top grossing app charts in the Apple store. 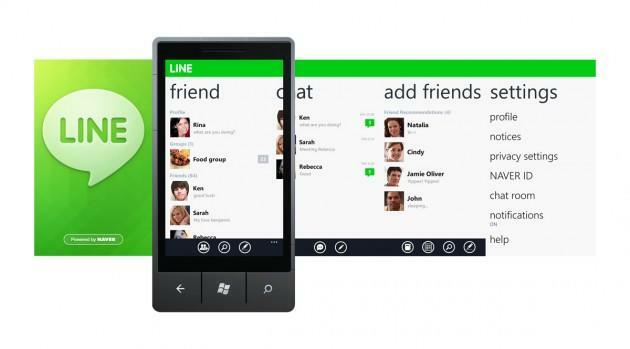 If you’d like to try Line for Windows Phone, you can get it here.